The Harpers Green Retirement development on the site of the former Bayleaf Restaurant, in Padgate, Warrington is a four-storey extra care development for over 55s. The 10,000 square meter site will house a mix of one-and-two bedroom flats for affordable rent and shared ownership, providing much needed affordable housing in the area. 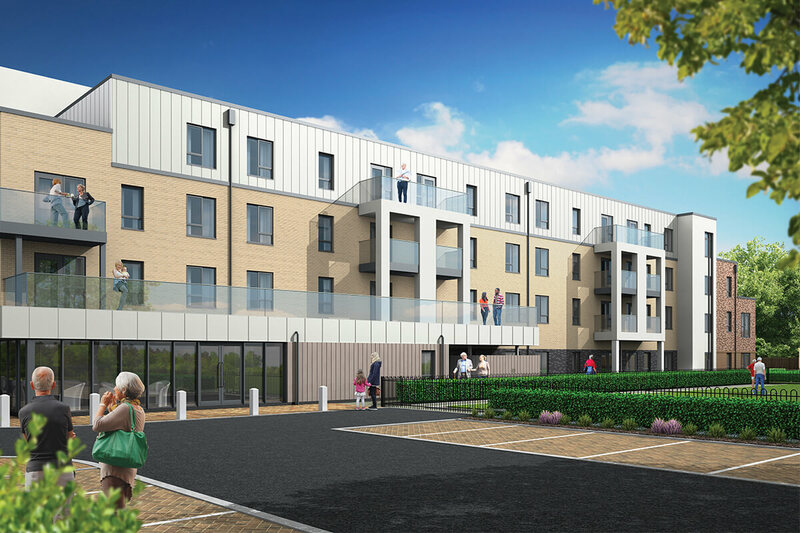 The contract to provide a new 97 apartment, extra care housing scheme, is the first project awarded on the new JV North framework, a consortium of major social housing associations across the North of England. 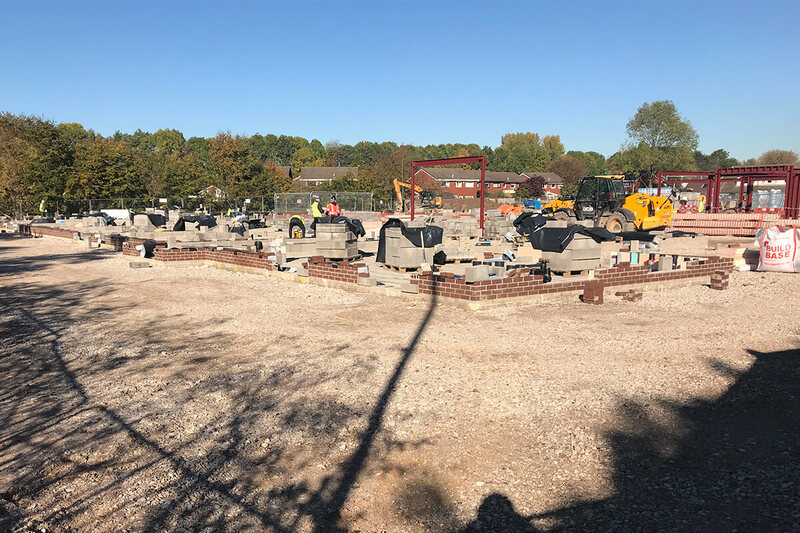 Anwyl Construction was one of just 12 successful applicants out of 30 construction companies which applied to be on the latest JV North framework which aims to build £335 million of affordable homes over the next four years. The four-storey apartments block has been designed by Paddock Johnson Architects for over 55s and the 10,000 square meter site will house a mix of one-and-two bedroom flats for affordable rent and shared ownership while on-site facilities will include a hair salon, bowling green and bistro. 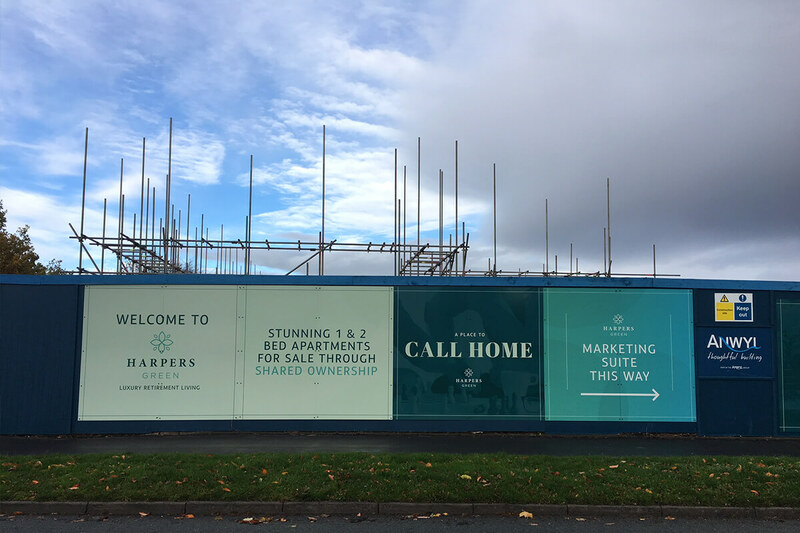 The Harpers Road development is part of an ambitious programme to deliver much needed affordable housing, across the North West, for first time buyers, growing families and those in later life. Our specialist housing for over 55s is sensitively planned and designed, creating communities where older people can enjoy sociable, fulfilling and healthy lives. The facilities at Harpers Road, including the bistro, hairdressing salon and bowling green will be available for residents in the wider community to enjoy too. 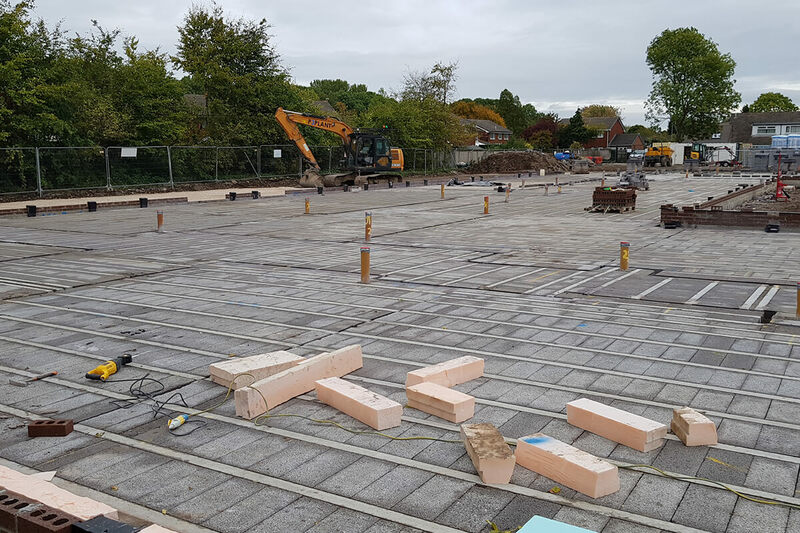 A Community Engagement Strategy has been developed in conjunction with Torus to ensure this project delivers the maximum positive impact to the community and the residents of the development. Job, apprenticeship & placements opportunities. Ivor Goodsite is on site increasing awareness of the potential hazards on a construction site to a younger audience. 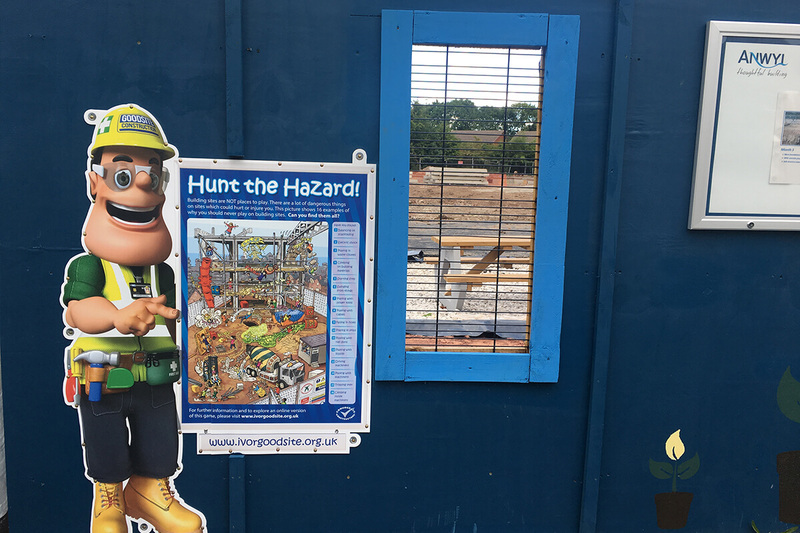 There is a ‘Hunt the Hazard’ displayed on the site hoarding highlighting some of the dangers that could be found on a construction site and shows why they are not safe places to play. The sign shows industry mascot, Ivor Goodsite, holding a colourful poster which displays a fictional construction site and highlights a number of potential hazards for children to find. 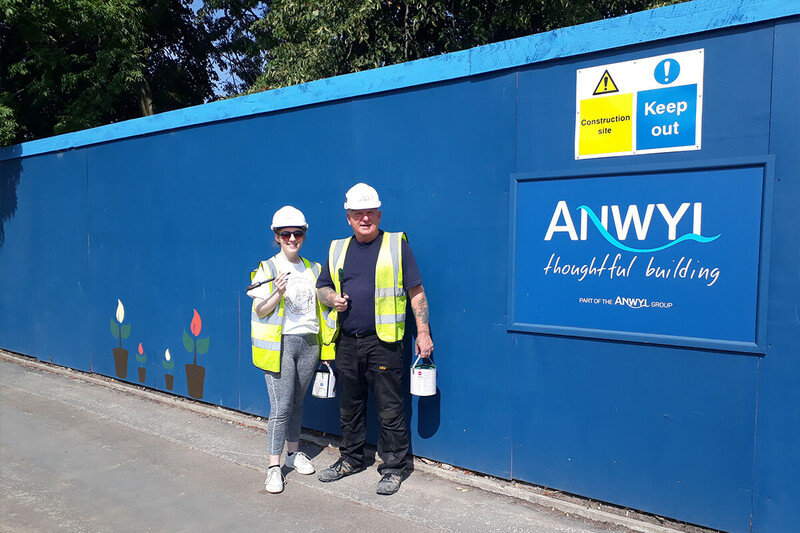 During the Summer months and taking inspiration from the nationwide competition ‘Britain in Bloom’ the site hoardings were customised with and decorated with flowers with the local community. Working with our client Torus we are running a local, targeted recruitment campaign and have recently appointed a Site Operative / Banksman.